You see, I had plans this weekend which included seeing the movie Courageous. I was excited for two reasons…1) I’ve been waiting for this movie to be released ever since I saw the trailer and 2) It has been many, many years since I last went to a movie theater to see a movie. It could have something to do with gum…shorts…gum stuck on shorts…not my gum…you get the picture. That little incident was enough to send me home to the movies and that is where I have stayed all of these years enjoying lounging on a comfortable chair, eating homemade popcorn and other special treats on one of our Family Movie Nights. Well, this movie almost drew me back into the movie theater, only for one night, but I couldn’t do it and instead will prolong my excitement and wait for it to hit DVD which should be in a few months. If you aren’t wimpy like me, then go see it and tell me what you think. 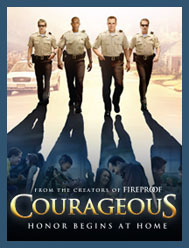 Courageous is brought to the screen by the creators of Fireproof and with a tag-line of “Protecting the streets is second nature to these men. Raising their children in a God-honoring way” That’s courageous,” it promises to make an impact on the lives of fathers just as Fireproof did on marriages. I’m already a fan of the song “Courageous” (take a listen) which is sung by Casting Crowns (I la la love them!) Squeal! I’m just so excited! Due to some of the content of the movie, it may make a better date night movie than a family night movie. So grab your husband (whether he is a father or not) and make it a date night to see this movie together. Tell me you’re not excited too! If you want to see the movie, then find a theater near you because Christian films are making an impact and they are showing up in neighborhoods everywhere. You go Sherwood Pictures! I am in no way affiliated with this move. This is just me “yammerin’” away about something I love (or am sure I’ll love after seeing it). I haven’t been to see it yet. I have enough drama in my own life and I am concerned that I don’t need the crying. Do you think it was overly emotional, or not?